I am currently designing a survey course on Japanese Religions in conjunction with a graduate seminar. I am also using this as an opportunity to reflect deeply on my process in a series of posts entitled Pondering Pedagogy: Course Design (listed below). Should we Abolish Page-Lengths When Assigning Student Papers? An introductory survey course that interrogates the common assumptions of the term “religion” through a focused examination and comparison of South Asian and East Asian traditions. Comparison is accomplished through the lenses of selected “threshold concepts” which aid the students in creating their own definition of religion based solely on traditions covered in this course. This course provided much fodder for my blog posts and was the impetus for my certification through the UCSB Summer Teaching Institute for Associates. I first taught this course at Ventura Community College and revamped it for a summer class at UCSB in 2017. A course that explores the history and innovative practices of Zen Buddhism as it developed in China, Japan, and North America. Students read Zen texts, ruminate on the meaning of Zen myths, ponder Zen poetry, contemplate Zen aesthetics, and creatively engage Zen meditation – all while tracing the elusive Zen “experience” of enlightenment. In the process, students develop a keen insight into the hallmarks of this East Asian tradition, differentiating it from its predecessors and contemporaries. I’ve had much fun with this material over the years, developing it out of a series of Woodenfish lectures (see below) and expanding it into a full course for UCSB in the summer of 2016 and revising it for Ventura Community College. An introductory survey course covering the transformation of Buddhism as Buddhists creatively (and pragmatically) responded to local cultural conditions across Asian and in the West. Students grapple with the philosophical implications of Buddhist doctrine and explore the impact it had on ethical, artistic, and religious practices. Much of this material, first conceived as a course in the Summer of 2014, derived from my lectures at the Woodenfish program years earlier. A upper-division course focused on the contours of Buddhism in China, highlighting both important doctrinal and practice-oriented innovations (as exemplified through Tiantai, Huayan, Pure Land, and Chan) as well as significant cultural shifts (as found in apocryphal texts, artistic expressions, pilgrimage practices, and elite literary compositions). I first taught this at the University of the West (Rosemead, CA) in the Spring of 2008. I cut my teeth teaching for the Woodenfish Program, a non-profit organization that brings university students to China to live and study in a traditional Chinese Buddhist monastery for a month during the summer. Envisioned as an “experiential education,” the program provides instruction on the academic study of Buddhism as well as traditional meditation practice and monastic discipline. I first taught for the program in 2005 (on Buddhist Ethics), and since 2013 I have been in charge of developing the academic curriculum in consultation with other volunteer instructors. 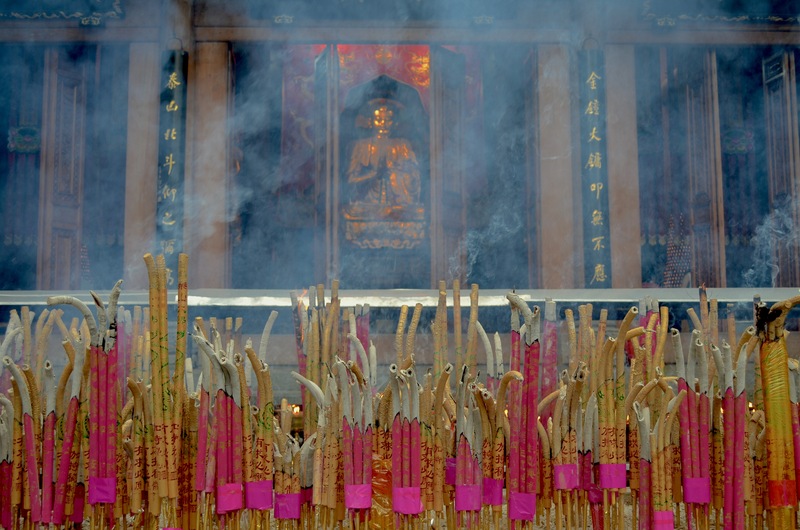 In 2013, the Woodenfish Program could be taken for college credit through Whittier College (its cross-listed as Chinese Buddhism: Philosophy and Practice). Since 2016 the Woodenfish Foundation has been granted Special Consultative Status with the Economic and Social Council of the United Nations. In teaching Religious Studies courses my primary goal is to foster critical thinking through cross-cultural and multi-sensorial modes of active, collaborative student learning. Ultimately, I believe students who critically engage the material and apply it in new contexts develop a greater personal resonance with the concepts and emerge as more thought-provoking writers and effective problem solvers.